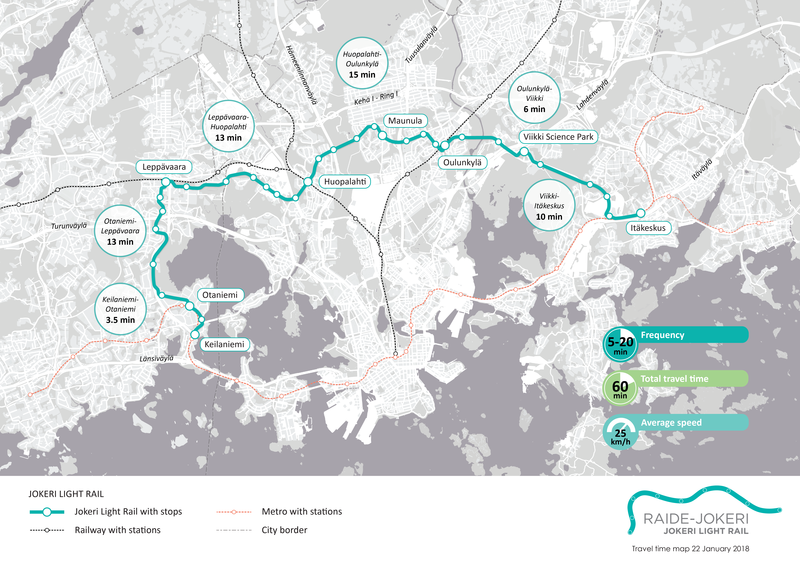 Jokeri Light Rail line will be built between Itäkeskus in Helsinki and Keilaniemi in Espoo. The planned length of the line is approximately 25 km (15.5 miles), of which 16 km will be in Helsinki and the remaining 9 km in Espoo. 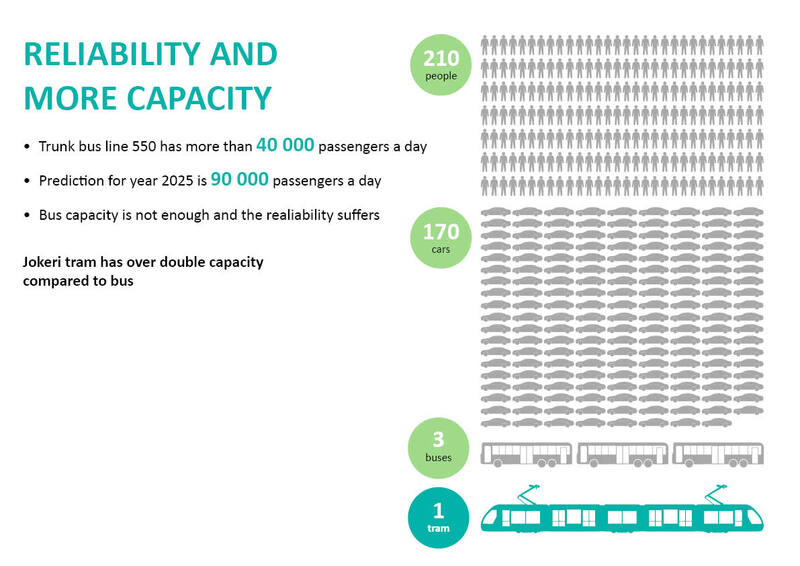 The light rail will replace trunk bus line 550, which is the busiest bus line in the Helsinki region. Jokeri Light Rail’s route and stops. Open a bigger version of the picture. It’s been estimated that about 102 000 people will be using the Jokeri Light Rail during one weekday in 2040. Today 40 000 people a day travel by trunk bus line 550. Jokeri Light Rail will increase the reliability, capacity and passenger comfort of transverse public transport. In addition, the capital region will receive a completely new form of transportation: light rail. Jokeri Light Rail will, for the most part, operate in its own lane with traffic signal priority, and its trams can be operated in two directions. Smooth operation will also be promoted by having the stops located more sparsely than along the tramways in inner Helsinki. There will be approximately two million residents and over a million jobs in the capital region in 2050. The goal is to steer the increased mobility resulting from the population growth into sustainable modes of transport: public transport, walking and cycling. 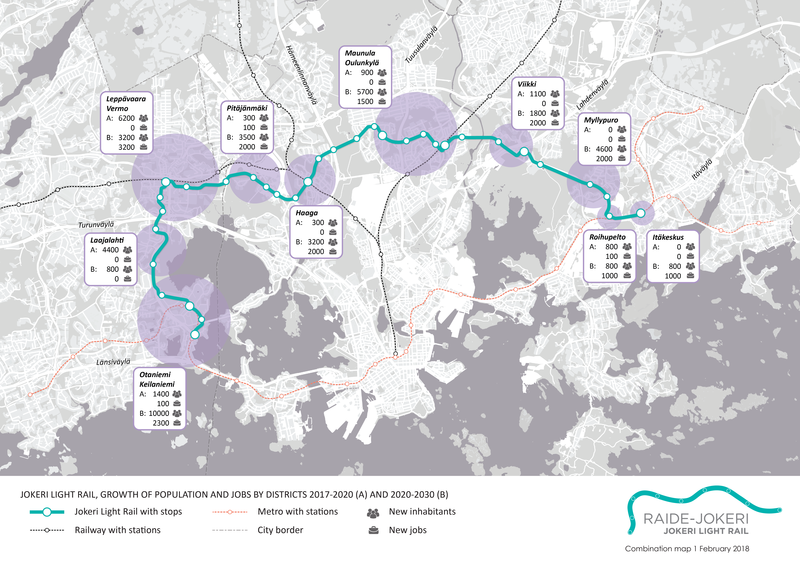 New housing and workplaces are planned to be built along the Jokeri Light Rail line in Itäkeskus, Myllypuro, Viikki, Oulunkylä, Maunula, Haaga, Pitäjänmäki, Perkkaa, Otaniemi and Keilaniemi, among other areas. Constructing housing and services along the Jokeri Light Rail route is advantageous and complies with the principles of sustainable development. Thanks to the proximity of services and the fast light rail, residents will have less need to use their own car. Growth of population and jobs by districts 2017-2020 and 2020-2030. Open a bigger version of the picture. Jokeri Light Rail will be implemented with the alliance model. This means that the client organization formed by the cities of Helsinki and Espoo will be combined into one organization, together with the planners and the implementers. The planners are Ramboll Finland, Sitowise and NRC Finland. YIT and NRC Finland are the constructors of the line. The parties to the alliance will design and construct the track together, sharing the risks and benefits related to the project’s implementation. Shaping models of an alliance organisation are early integration, mutual targets, contract and mutual commercial model, shared risks and benefits and mutual development phase. The operating principles of an alliance organisation are working for the best for the project, building trust and continuous improvement. The Jokeri Light Rail alliance project is executed as consecutive development phase (11/2017-12/2018) and implementation phase (1/2019- ). During the development phase, the contractual parties plan the contents and execution of the project together and define its target cost and incentive system. As the development phase ends, the client will decide execution of the investment and on transition to the implementation phase. The development and implementation phases will have own contracts. According to the preliminary estimate, construction of the track will commence in 2019. The inconveniences of the construction will be minimised as much as possible with functional temporary traffic arrangements. The smooth operation of bus line 550 will be ensured throughout the project, and the construction areas will be designed to be safe and accessible. Jokeri Light Rail is expected to start operation in the early 2020s. Jokeri Light Rail’s traveltimes. Open a bigger version of the picture. Jokeri Light Rail’s capasity. Open a bigger version of the picture.